A poison is anything that can harm someone if it is used in the wrong way, used by the wrong person or used in the wrong amount. 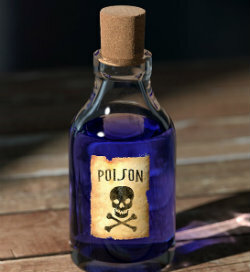 Some poisons hurt you when they are ingested, while others can harm you if they get in your eyes or on your skin. We use many products we may not think of as poisons; however, many everyday products can be poisonous. Is it time to do a little spring cleaning? Make it a point to do a little poison proofing of your home. Inspect your entire home for any medicines or household products (detergents, cleaning products, pesticides, chemicals) that may not be stored properly. Always store these products high and out-of-reach of children. Keep poisons in the containers they came in with their original labeling. Do not use food containers to store household cleaners, chemicals or other products and do not store them near food. Read and follow the directions for a product’s proper use and disposal. Have a working carbon monoxide detector in your home; the best places for a CO detector are near bedrooms and close to furnaces. Know that pesticides can be taken in through the skin or inhaled. Stay away from areas that have been sprayed until the spray has dried or for at least one hour. Wear protective clothing when using bug spray or other spray products. If pesticides are splashed on the skin, rinse with running water for 15 to 20 minutes. Chemicals, such as drain openers, toilet cleaners, and oven cleaners can burn the skin. Insect stings can cause serious problems and even death for those who are allergic to them. Go to the hospital if you have been stung and start showing signs of hives, dizziness, breathing trouble or swelling around the eyes or mouth. Two common spiders that can harm you are the female black widow and the brown recluse. Within 36 hours of being bitten you may see or feel signs of poisoning – restlessness, fever, chills, nausea, weakness, rash or joint pain. Missouri is known to be home to the brown recluse. Of course, the first step if you think someone has been poisoned is to call Poison Help, 800-222-1222 to reach your local poison center.